Hey Guys.. just wanted to let everyone know about the 1st Annual AZ Off-Road Swap Meet coming to Westworld of Scottsdale on December 3rd. 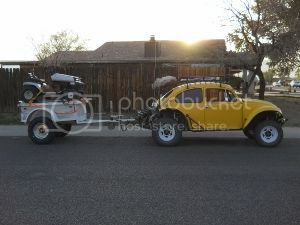 Check out www.azoffroadswapmeet.com for details. Vendor count is increasing daily. You can buy vendor spots on our website or at the gate on December 2-3. Buying them online ahead of time gets you 25% off. Let us know if you have any questions or need additional details! have to go check this out. It was a good swap for being the first year, picked up a couple things. Just picked up some VW stuff, an oil cooler with fan set up, a couple mirrors, some in car tool bags, and a couple other small items. If you had the money there was plenty of VW stuff to buy. Shocks, suspension seats, tires, rims, Entire motors, suspension parts. Definitely need to save some money for next years.